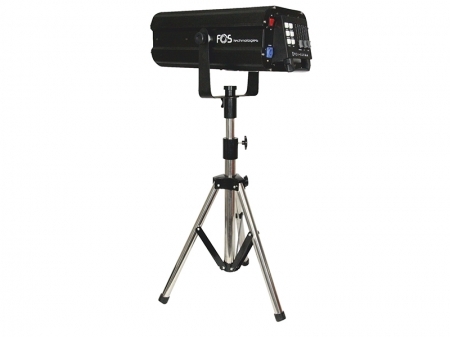 High Power Led Follow Spot with 300 watt Led , 2 color correction & frost filters, Iris, Dimmer, 5 colors red, green, blue, yellow, white , adjustable focus, Powercon In, Flight case with wheels and stand included. Luminocity: ≈ 200.000 lux @ 1m, ≈ 73.000 lux @ 5m, ≈ 2100 lux @ 10m. Wheel with 2 color correction filters and frost. Buttons for instant access to the five plus clear (white) colors. The FOS Follow Spot 300 comes with flight case and stand. Total Weight (including the case): 34,3 Kg.